Specially formulated for oily or blemished skin, Clarifying Toner balances excessive oiliness, soothes redness and minimizes the appearance of blemishes, blackheads and enlarged pores. Formulation: Daisy and nasturtium minimize the appearance of blackheads and blemishes, visibly refine pores and reduce excessive oiliness. Anthyllis balances skin for a calm, even appearance. Skin Condition: For oily, blemished or combination skin. OMG, I went thru such a crazy bout of adult acne from stress, that no other products were able to help. 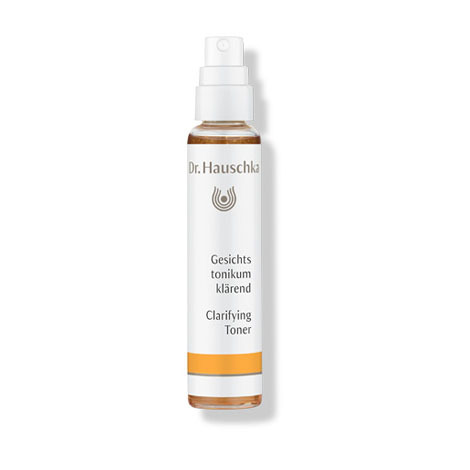 Got Hauschka’s Clarifying Day Oil & Clarifying Toner & literally I woke up & my skin was soooo much better! In two days, it’s a totally different complexion, acne marks are disappearing & I’m in love w/ my glow! Thank you?? I absolutely love to use the toner after cleaning my face in the morning. It refreshes my face and moisturizes my dry skin. I feel like I am giving my face to a wonderful treatment. Love this toner. Feels like I am in a spa. This is a skin care must have. Effective, pleasant and natural; Everything I ask for. I have used this product for several years. I love the smell, the way it feels, and the way it seems to balance my complexion, I don't leave home without it. Doesn’t seem to do much! Just started using and it seems to work fine. The toner I have used for years has been discontinued and since I was already using Dr. Hauschka's products, decided to go all the way. Just started using it and swear my skin is looking better. I feel refreshed as soon as the spray hits my face! I have combination skin and large pores have always been an issue for me. This toner is amazing and my pores have never looked better. I can't believe it. I don't know how I lived without it. I love this toner. It really evens out my skin tone and makes my face radiant. I've tried the regular toner, but this one is noticeably the better one for my skin. It took my dull skin and on the first use made it so lovely I didn't want to wear foundation, and with a moisturizer, I don't. 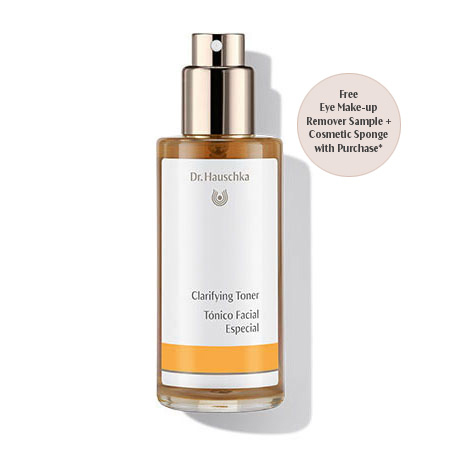 You all did a really good job on this product Dr. Hauschka folks! I seem to keep going back to this product. It’s sufficiently clarifying without over-drying and I like to use first in morning and last at night. My skin is mostly on the oily side even at age 65. Great quality product. I was concerned about using a "clarifying" toner on irritable skin - other toners geared toward oily or blemished skin had previously dried me out and caused more redness and acne. But this works beautifully! It's so gentle and helps a great deal with blemishes and balancing my skin without drying it out. I love spritzing this on my face. My skin feels balanced and refreshed, and I think it makes my skin look healthy. Fantastic product. The mister allows for a light application which leaves your skin refreshed. It helps control oil and mild irritations. I am absolutely in love with this toner. My skin is less red and oily since I started using it. Someone gave me a basket of Dr. Hauschka products as a gift. This toner sounded like it would not be right for my normal skin so I use it on my very dry legs. It does stop the dryness, So I hope it's okay to use it there. I accidentally sprayed it into my eyes, but it was not as irritating as other brands' products, and I liked its mildness. This toner is so refreshing and helps my skin feel soft, it also makes it easier to apply the regenerating serum and day cream. Refreshing, and works well with combination skin. Great product keeps my skin clear and clean. Toners don't get the love they deserve as part of a regular beauty routine, but this clarifying toner does exactly what it should for sensitive/combination skin. It leaves skin feeling clean, and fresh! A great product! I use this toner when my skin is more blemished than normal. It dries the oil up perfectly. When my skin is feeling less oily I use the regular toner. Both are great. This is the best toner for helping to keep my skin clear and fresh. I love it. Very nice. Especially in warmer months. In winter I use the regular tone. I have fairly normal skin but was dealing with an increase in little breakouts about eight months ago. I added this product into my routine to help balance things out. I am happy to say that it has helped get back to normal. Would definitely recommend. Was not like the sample I tried. The sample had a great, crisp fragrance which is why I purchased a full size. Again another disappointing experience. Smells like rancid dirt. Not fresh. Yuck. Hard to enjoy a new regime, when nothing is as expected with high end, expensive product. I have an incredibly oily T Zone. I have noticed a big difference since I started using this toner. I do still get oily but nowhere near as much as I used to and it seems like it isn't until later in the day. I did not notice a difference in my pore size, which I was hoping for. This is the only toner I've used for almost 9 years now. It smells nice, does not dry my skin and is just perfect. I have used this in the Winter months after the cleansing cream and my face feels fantastic. I have super sensitive skin that very occasionally breaks out and this used with the day cream seems like a perfect combination for the cold dry months. Is not too drying. Love the way my pores look after. Very happy with this. I use the clarifying toner daily after cleansing. It soothes and hydrates my skin, making me feel rejuvenated. I really like this product. Most everything I try clogs my pores and I end up breaking out. I use this with the clarifying oil and my ski is just right. Not overly oily and not dried out. I tried to replace/balance out this toner w/ something less pricey. But I had to go back to it. It hydrates, smells superb (roses? ), keeps me clear, and the bottle is beautiful. Joyful to apply. I'll probably keep getting it for the rest of my life. I'm new to this clarifying toner. I've been using the facial toner for a long time. I like this toner when my face needs that extra cleansing. I have oily skin/sensitive skin and it doesn't cause over drying. Leaves skin feeling fresh and clean. Lovely. Absolutely lovely. Gentle, yet effective. It saved my skin and continues to work every time I use it. Great toner. It definitely minimizes ones' pores. The Clarifying Toner is filled with wonderful ingredients that help to soothe my skin and relieve it of any irritation while calming redness and minimizing the look of pores. I love the fine mist and the smell is divine! I love the smell and the nice mist, as well as the feel on my face. Overall great product. I have been using Dr. Haushka Clarifying Toner for many years. It has been and continues to be a kind of miracle toner and sometime healer for my aging skin. I am deeply appreciative of the research that has gone into developing this product. Thank you. This product works great on my combination skin. When I don't use it, my pores are larger and my skin looks ruddy. It's very calming and balancing without being irritating. I have to make myself use restraint when spritzing this on because it is so wonderful it is tempting to douse myself in it. Calms my skin right down, helps address any aggravated pores or blemishes. I stopped using proactive and replaced it with Dr. Hauschka products and this is the best one. After cleansing in the morning and evening, mist evenly onto the face, neck and décolleté then gently press into the skin. Clarifying Toner is a refreshing, soothing aftershave for men with sensitive skin. Mornings: follow with an appropriate day moisturizer. Evenings: no moisturizer is needed. Dr. Hauschka Skin Care does not recommend the use of oil-based night care like night creams, which can interrupt the skin’s essential night-time processes. 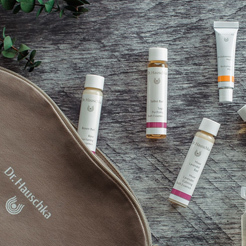 Dr. Hauschka’s water-based night care products support the skin’s essential nighttime tasks of cleansing, balancing and renewal. Coverstick (available in 3 tones) soothes and nurtures while blending away the appearance of blemishes. Weekly deep cleansing and conditioning with Clarifying Steam Bath, Clarifying Clay Mask and Revitalizing Mask is also recommended. Clarifying Toner is a refreshing, soothing aftershave for men with sensitive skin.